Some B2B leaders are shying away from thought leadership marketing because they see it as a form of promotion: something that doesn’t apply (or necessarily appeal) to their end customer. They know where their lane is, and they want to stay there. But what if I told you that thought leadership is the best way to appeal to your buyer population and generate revenues? Almost every single B2B buyer (96%)1 are asking for more content from thought leaders in their industry. They not only want it, they need it, as at least 67%2 of the buying process is done online, without any human intervention. Thought leadership marketing is a way to reach and educate those buyers. And if you’re not sharing your expertise online, customers may go to a company that is. What Exactly is Thought Leadership Marketing? It’s the process of establishing your company as the go-to resource for knowledge of a specific industry, problem or technology. Thought leadership shows that you know what you're doing, that you understand your customers' pain points and you know how to solve their problems. And even a series of Tweets! All of these tactics will lend themselves to thought leadership marketing, and at least some of them should fit into your strategic marketing plan and budget. You need to include thought leadership in your overall content plan, rather than just publishing one piece and moving on. Why? Because 47% of B2B buyers view 3-5 pieces of content before engaging with a sales rep,3 and as we noted above, almost every buyer is asking for more thought leadership content. What makes thought leadership different from Promoton? As a B2B business owner/leader, you likely know more about your product and industry than anyone else in your company. Thought leadership is about sharing that knowledge, whereas self-promotion is about promoting your company. Buyers are looking for information as they go down the path to purchase. Focus on providing the information that buyers will need to make an informed decision. Rather than focusing on your product, address the universal pain points of all similar products in the industry. You can mention your product or service briefly at the end, but make the body content all about what buyers need. You’re not expected to know everything about every part of your industry. Use what you know. You likely occupy a niche in your industry. This is what differentiates you and this is what you need to talk about. You will be much more effective with a deep and narrow piece than a general one that tries to accomplish too much. The B2B buying process generally involves many buyers at different levels. We refer to the different buyer types as buyer personas. The white paper that appeals to the CEO may not appeal to a lower-ranking person who is doing the initial product research. They may be more drawn to a blog or a LinkedIn post. Where am I going with this? Once you have a piece of thought leadership content, it can be massaged and reused in other forms. A 10-page white paper can become a blog series or a couple of articles. If there is an abundance of stats, that white paper can even be the basis of an infographic. If you upcycle your content, you will get more mileage from it and reach more of your buyer personas. WHY SHOULD THOUGHT LEADERSHIP BE PART OF YOUR STRATEGIC MARKETING MIX? Thought leadership might sound like very hard work, and work you don’t have time for right now, but it’s important for supporting your sales efforts. And rest assured that you don’t have to write the content yourself. In-house marketing or your agency can interview you and take care of how the content is used. Use your expert knowledge to generate more credibility for your business and grow revenue. 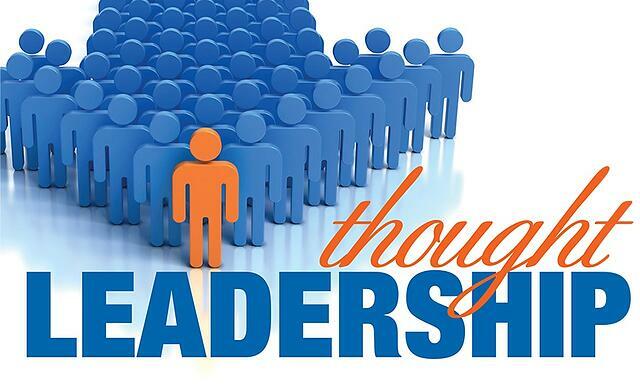 It’s a fact that 80% of business decision makers would rather get their information from thought leadership like articles, rather than ads.4 Sharing thought leadership is one of the most effective ways to get on the radar of new customers and to stay top of mind with your existing ones. So, what are you waiting for? Contact us today to discuss a thought leadership strategy for your business!